Color Fill enhances visual perception of price action and assists with decisions of trade entry, continuation, exit and trade re-entry on trend continuation. The Tenkan Sen and Kijun Sen components of the Ichimuko Kinko Hyo Indicator. The below Color Fill options. Note: The Color Fill is not a part of the Ichimoku Kinko Hyo indicator and should not be confused with the Ichimoku Cloud. Color Fill between Price and Tenkan Sen.
Color Fill between Price and Kijun Sen.
Color Fill between Tenkan Sen and Kijun Sen.
All default inputs and parameters can be changed and saved to a user named .set file for later recall and reuse via the Save and Load buttons on the Inputs tab. The user should investigate personal preferences and parameter settings. The Tenkan Sen and Kijun Sen periods are not set at the traditional 9 and 26 but these can be easily changed and saved using the above procedure. The Tenkan Sen and Kijun Sen periods are set at 50 and 100 as general optimization for M30 - H4. Adjust Tenkan Sen and Kijun Sen periods as required. Line thickness can be increased for better visual definition. 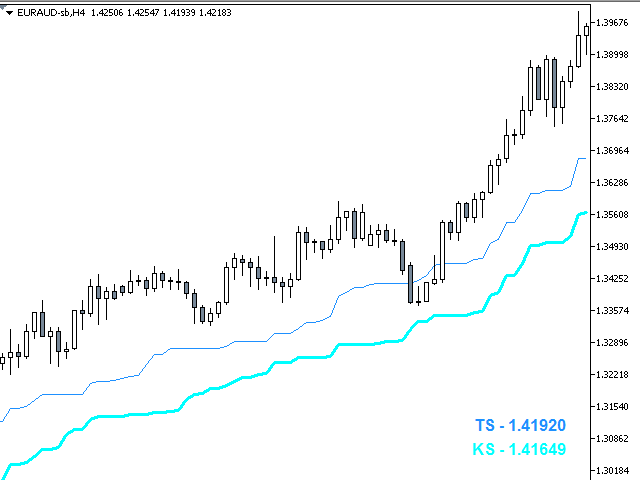 Note: The Tenkan Sen and Kijun Sen are the same indicator. 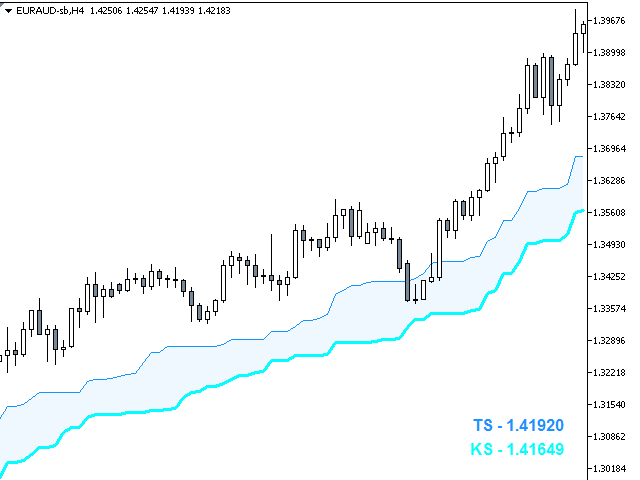 The non programmer can prove this by placing the Ichimoku Kinko Hyo Indicator (MetaTrader 5 → Insert → Indicators → Trend → Ichimoku Kink Hyo) on a H4 chart and setting Tenkan Sen and Kijun Sen to periods 26 and 27 respectively. The Tenkan Sen and Kinjun Sen are slightly apart. Now change both to period 27. Both now overlay each other exactly. This is brought to the user's attention in order to avoid misunderstanding that can arise while using the present Indicator. The Labels are positioned at the lower right corner but can be re-positioned to any position on the chart. The Price Labels can be hidden if not required. If the Tenkan Sen or Kijun Sen is hidden the associated Price Label will also be hidden. 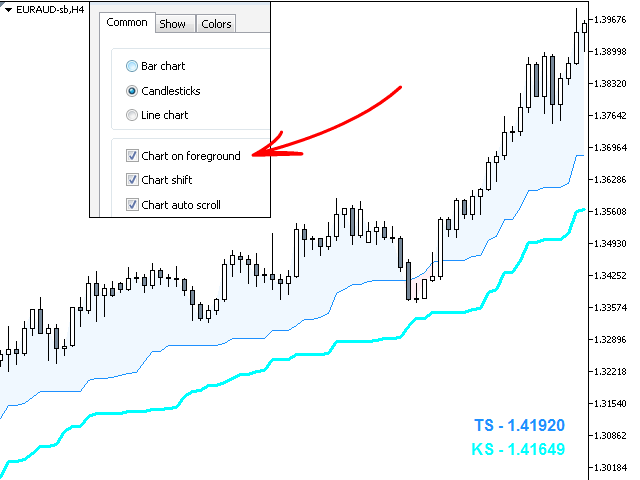 Accuracy of a Price Labels can be determined by drawing a horizontal line on the chart and setting the line Parameters - Value to the price indicated on a TS or KS Label. 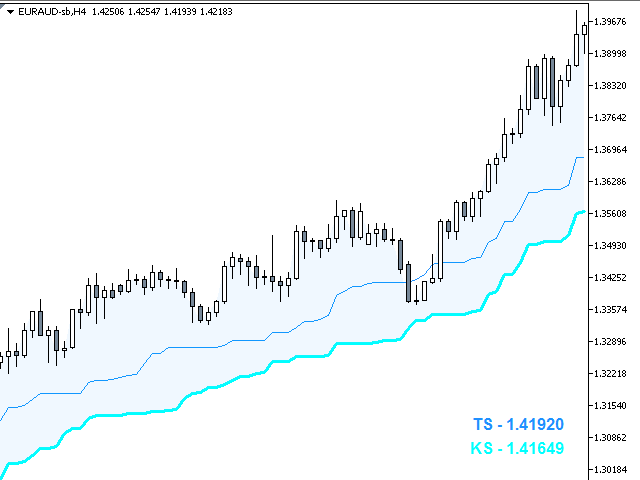 The horizontal line will align precisely with the end of the Tenkan Sen or Kijun Sen depending on Label chosen. Bid price line - LightSlateGray. Ask price line - LightSlateGray. Last price line - Green. Fill Select - Price - Tenkan Sen. Fill Long Color - AliceBlue. Fill Short Color - LavenderBlush. Period Tenkan Sen - 50. Color Tenkan Sen - DodgerBlue. Color Kijun Sen - Aqua. Width Tenkan Sen - 1. Width Kijun Sen - 1. Style Tenkan Sen - Solid. Style Kijun Sen - Solid. Show Tenkan Sen - true. Show Kijun Sen - true. Label Corner - Right lower chart corner. Label Left or Right - 20. Label Up or Down - 20. Check Chart on foreground - Chart Properties (press F8).